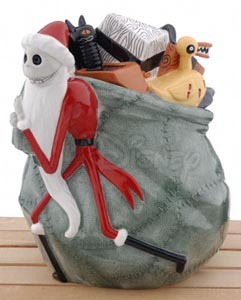 The latest limited edition at Disney Auctions is the Nightmare Before Christmas Santa Jack Cookie Jar. The Cookie Jar features Santa Jack Skellington with a sack overflowing with haunted holiday goodies ably assisted by his dog Zero.. The piece measures 10.75″ x 12.75″ x 13″ and is being produced in a Limited Edition of 350. For more details visit Disney Auctions web site. Visit the WCN Nightmare Before Christmas information pages and message boards.